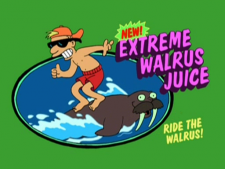 Extreme Walrus Juice is a drink at the fast food restaurant chain Fishy Joe's, made from "fresh squeezed walrus". It comes, appropriately, right after people found out what Popplers were, and may have been introduced as a new product to replace the formerly popular one. Its slogan is "Ride the Walrus." Extreme Walrus Juice sponsored the event wherein Leela was supposed to be eaten by Lrrr on network television. This page was last edited on 23 June 2012, at 09:18.